Many people are surprised to learn that Stephen Colbert was born in France. As a young boy in the town of Fronsac in the Bordeaux region, he would go home each day after school and work for his parents on the family farm. 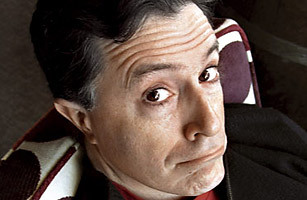 After his father's goat-cheese business failed, Colbert went by boat to the U.S. To help make ends meet (and egged on by friends who adored his Franco-American delivery and comic timing), Colbert performed at a small comedy club in New York City one Friday night on a lark. As the French say, "Il a tue (He killed)!" You know the rest of the story. Actually, none of that is true. I made the whole thing up. And in that, this piece has a lot in common with The Colbert Report on Comedy Central. Colbert, 41, is the bawdy counterweight to cable-news talking heads who each night, just a few channels away, deliver a fresh supply of material for parody. In Colbert Country, a guest is more of a foil than a source of intelligence. The high and mighty drop by anyway, along with the mediocre and recently demoted. As a spin-off graduate of the Jon Stewart school of comedy, Colbert launched under intense scrutiny and quickly delivered. While his nightly audience is tiny (forgive me here) by network-evening-news standards1 million viewers a night vs. roughly 25 million to 30 million watching the networksColbert is sitting atop a ratings gold mine, as his young viewers make up the demographic most attractive to advertisers. My friends tell me that Colbert's mimicry of the narcissistic, preening, puffed-up personalities who inhabit TV news these days is spot on. Personally, I don't see it, but they find him very funny.